I have noticed a new arrival on my road lately. 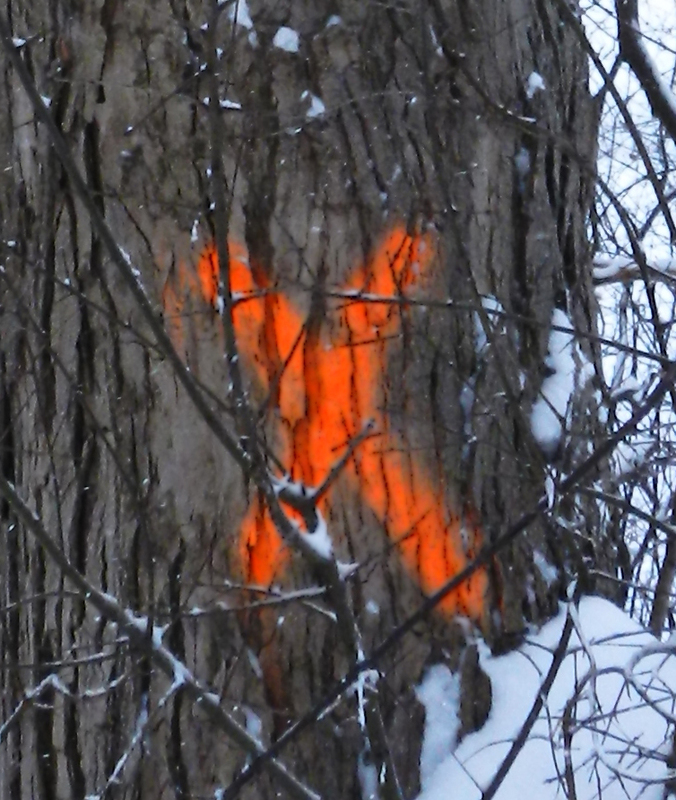 Big orange x-es are appearing on the old maple trees. Those who know me or follow this blog know that I have a soft spot for trees. I love their ability to overcome hardship and damage as well as their peaceful acceptance of the seasons. This marking happens every year and always makes me sad. 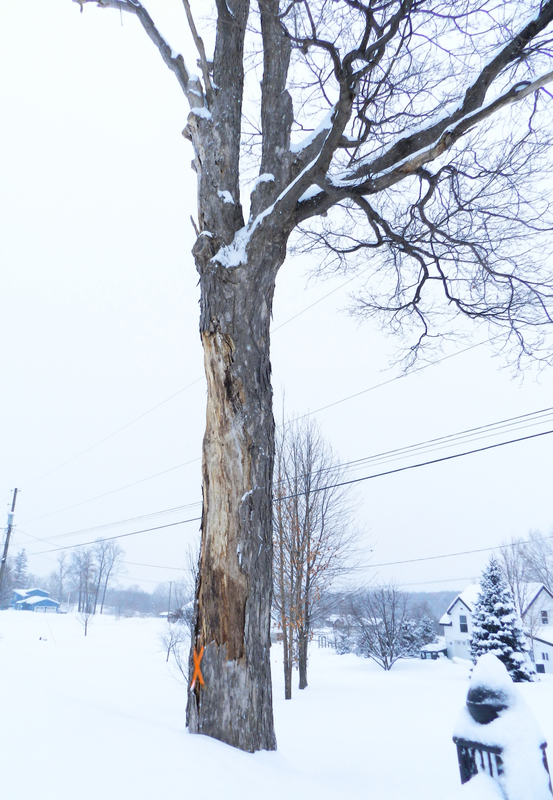 These are the trees the county has decided are too old and ill to survive. They have become a hazard to the road below and the ugly black wires that stretch from pole to pole. We can’t have them shedding limbs and stopping traffic or bringing down the wires now can we? It doesn’t matter if the trees were there first. It doesn’t matter that they have been standing there tall and strong for 100 or 200 years. They are a liability. Now I know that there is truth to that. 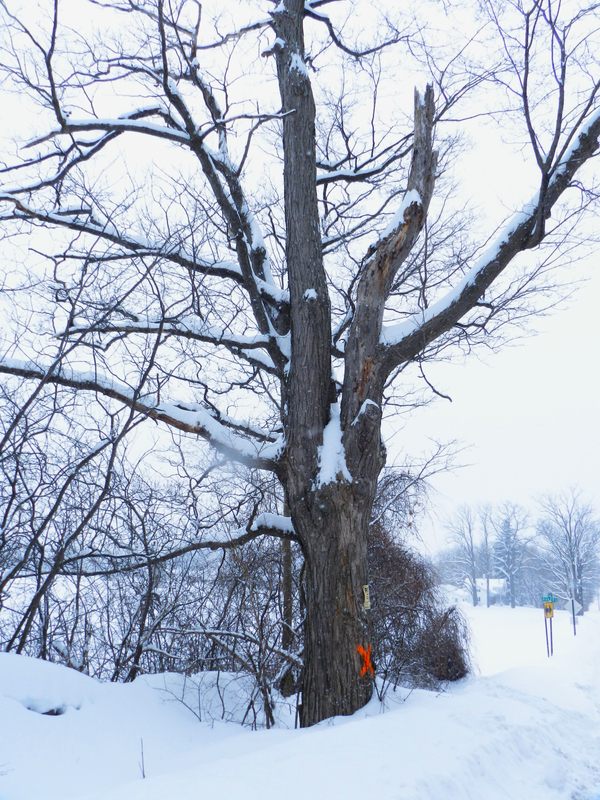 The marked trees have lost much of their former glory. Halfway up, jagged stumps remain where the main trunk had been lost to a storm or lightning a decade ago. Often there are only a few branches that still produce leaves, and those are growing sparse. The bark is rough and split with dead wood showing through. They are dying. But I remember them as they were 30 years ago when my family moved onto this farm. They were at their prime and there were so many more of them back then. They lined the road every fifty feet or so. They were the home to thousands of birds, squirrels and chipmunks . . . not to mention the occasional raccoon and possum families. In the fall, the road became a glorious bower of red and gold splendor. The family we bought our farm from told us some of the history of the area. They had lived here for generations, since the 1800’s at least. Our farm began as a small cabin at the base of a nearby hill. The hard working farmer who first settled here soon built a larger place where the house currently stands. It started as two small rooms and has expanded several times so that it can now hold my sister’s family and my own. That same farmer was wise enough and compassionate enough to plant these so that his horses would have shade as they toiled along the dirt road. The fields were wide open by necessity, but the roads to and from was thick with cool, refreshing shade. The trees fulfilled their purpose long after teams of horses gave way to tractors and trucks. More than 100 years later they continued to stand guard over five young girls riding their bikes or walking 1/4 mile to the nearest house to play with the children who lived there. So many times I would climb into their spreading boughs when the world became a hard place to live. I would go high as I dared and cling with my ear pressed to the trunk. There I could hear the creaking and sighing of the ancient tree. It seemed that it was talking to me, if only I could understand the words. Now there are few of my old friends left. One by one they have fallen to the storms of the world or that dreaded orange X. The sunlit street is lined with new homes. Children no longer ride their bikes or walk in the road . . . with cars whizzing by without thought or care it is no longer safe. Time marches on and everything must someday fall to its command. I still hate the big orange X. The other day when I was thinking about those trees marked for execution, my thoughts strayed to the Great Gardener. Perhaps if someone had tended to those old trees, they may have survived longer. If someone with skill had trimmed the diseased and damaged branches, had kept away the strangling vines, the trees would have been strong enough to withstand the storms. Jesus said that he was the vine and we are the branches. (Israel doesn’t have much in the way of maple trees.) He knows how to tend to his branches to keep them healthy and strong. He prunes and binds, trims and trains so that we become all that the Father meant us to be. He does not paint big orange X’s on us when we become old and weak. He tends us and loves us until time wins its battle. Then he takes us home where we are planted by streams of living water to become forever young, forever strong and forever with him.